Settlers feature in many protracted territorial disputes and ethnic conflicts around the world. 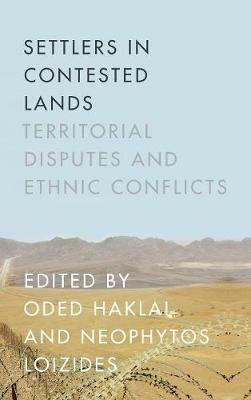 Explaining the dynamics of the politics of settlers in contested territories in several contemporary cases, this book illuminates how settler-related conflicts emerge, evolve, and are significantly more difficult to resolve than other disputes. Written by country experts, chapters consider Israel and the West Bank, Arab settlers in Kirkuk, Moroccan settlers in Western Sahara, settlers from Fascist Italy in North Africa, Turkish settlers in Cyprus, Indonesian settlers in East Timor, and Sinhalese settlers in Sri Lanka. Addressing four common topics-right-sizing the state, mobilization and violence, the framing process, and legal principles versus pragmatism-the cases taken together raise interrelated questions about the role of settlers in conflicts in contested territory. Then looking beyond the similar characteristics, these cases also illuminate key differences in levels of settler mobilization and the impact these differences can have on peace processes to help explain different outcomes of settler-related conflicts. Finally, cases investigate the causes of settler mobilization and identify relevant conflict resolution mechanisms.